NOW THEREFORE, be it resolved that the City of Valdosta supports the Lowndes County Board of Commissioners in their opposition to the construction of the Sabal Trail pipeline in any portion of Lowndes County. The City’s support includes concerns with fundamental property rights, the manner in which eminent domain might be utilized, and the lack of demonstrated benefit to the City and County. Furthermore, the City of Valdosta supports the Lowndes County Commission in their formal request to the Federal Energy Regulation Commission (FERC), and to State and Federal Legislators in the effort to have Lowndes County and the State of Georgia bypassed in the construction of the proposed pipeline. This entry was posted in Government, Law, LCDP, Lowndes County Commission, Pipeline, Safety, Transportation, Valdosta City Council, WACE, Water, WWALS and tagged 11 December 2014, 9 December 2014, Georgia, Government, Gretchen Quarterman, John S. Quarterman, LAKE, Larry Hanson, Law, LCDP, Lowndes Area Knowledge Exchange, Lowndes County, Lowndes County Commission, Michael G. Noll, pipeline, Regular Session, Sabal Trail Transmission, Safety, Spectra Energy, Thomas Hochschild, Tim Carroll, Transportation, Valdosta, Valdosta City Council, WACE, Water, Work Session, WWALS on December 12, 2014 by John S. Quarterman. 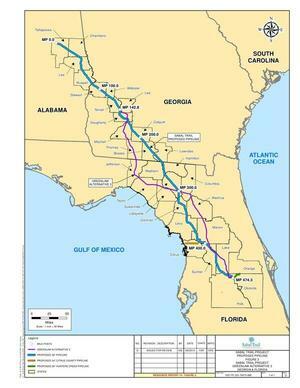 The resolution against the Sabal Trail pipeline, including to be filed with FERC, was passed 6 to 1 by the Valdosta City Council Thursday 11 December 2014, supporting the resolution the Lowndes County Commission passed unanimously Tuesday, plus a clause about protecting our drinking water in the Floridan Aquifer; see separate post. John Robinson thanked the city for a VSEB contract. The personal care home rezoning passed. The taxicab ordinance was deferred (not all cab company owners had been consulted yet), while two others passed. Also some bids rejected while others were approved, a reappointment of Tom Kurrie to the Valdosta Housing Authority, and recognized employee of the month Terrial Small. Here’s the agenda. For background, see the videos of the Tuesday Work Session, including a bomb report by Police Chief Childress. The videos from the Thursday Regular Session are linked below, followed by a video playlist. This entry was posted in Government, Health Care, Law, LCDP, Pipeline, Safety, Transportation, Valdosta City Council, WACE, Water, WWALS and tagged 11 December 2014, 9 December 2014, Georgia, Government, Gretchen Quarterman, Health Care, John Robinson, John S. Quarterman, LAKE, Larry Hanson, Law, LCDP, Lowndes Area Knowledge Exchange, Lowndes County, Michael G. Noll, Normal Life of Georgia, pipeline, Regular Session, Sabal Trail Transmission, Safety, Spectra Energy, Thomas Hochschild, Tim Carroll, Transportation, Valdosta, Valdosta City Council, Valdosta Housing Authority, WACE, Water, Work Session, WWALS on December 12, 2014 by John S. Quarterman. The Valdosta City Council discussed a resolution against the Sabal Trail pipeline at their Work Session Tuesday, as you can see in these videos. Come see them vote on it tonight at 5:30 PM at City Hall. They also heard a bomb report at the Work Session, in addition to discussing all the other business, especially the taxicab ordinance. This entry was posted in Government, Health Care, Law, Pipeline, Safety, Valdosta City Council, Water and tagged 9 December 2014, Georgia, Government, Health Care, John S. Quarterman, LAKE, Law, Lowndes Area Knowledge Exchange, Lowndes County, Normal Life of Georgia, pipeline, Sabal Trail Transmission, Safety, Spectra Energy, Tim Carroll, Transporation, Valdosta, Valdosta City Council, Valdosta Housing Authority, Water, Work Session on December 11, 2014 by John S. Quarterman. The vote was unanimous for the resolution against the Sabal Trail pipeline at the Lowndes County Commission Tuesday, to be followed tonight by the Valdosta City Council voting on their resolution of support for Lowndes County against Sabal Trail, including an additional clause about protecting our drinking water in the Floridan Aquifer. This follows a long string of county and city resolutions against that unnecessary, destructive, and hazardous pipeline boondoggle. This entry was posted in Alcohol, Economy, Government, KLVB, Lowndes County Commission, Natural gas, Pipeline, Solid Waste, Transparency, Transportation, Trash, VLCCCTA and tagged 9 December 2014, Advanced Disposal Services, Alcohol, board packet, Economy, Georgia, Government, Gretchen Quarterman, KLVB, LAKE, LCC, Lowndes Area Knowledge Exchange, Lowndes County, Lowndes County Commission, natural gas, open records, pipeline, Regular Session, Sabal Trail Transmission, Solid Waste, Spectra Energy, Steve Edwards, Transparency, Transportation, Trash, Valdosta, VLCCCTA, Work Session on December 11, 2014 by John S. Quarterman. Many thanks to Tim Carroll for adding the part about this important environmental issue which affects everyone in the city of Valdosta and Lowndes County as well. This is not just about the property rights of a few concerned citizens although those are important as well and demand protection from elected politicians. This entry was posted in Education, Georgia, Government, Law, Valdosta City Council, Water and tagged 9 December 2014, collapse, Don Thieme, drinking water, Education, Floridan Aquifer, Georgia, Government, John S. Quarterman, LAKE, Law, leak, Lowndes Area Knowledge Exchange, Lowndes County, Sabal Trail Transmission, sinkhole, Spectra Energy, Valdosta, Valdosta City Council, Water, Withlacoochee River, Work Session on December 11, 2014 by John S. Quarterman. He concluded, “There’s nothing beneficial to the state of Georgia in this pipeline.” Some Commissioners had never heard of Sabal Trail: now they have, from local resident Alton Paul Burns, at their 9 December 2014 Thomas County Commission Regular Session, and they know it could come right through Thomasville. Discussing among themselves, one Commissioner remarked that the pipeline wouldn’t go through her place, but it was still a concern, and they should ask Sabal Trail to come explain themselves. This entry was posted in Climate change, Coal, Economy, EPA, Government, Natural gas, Oil, Pipeline, Safety, Transparency and tagged 225 N. Broad Street, 9 December 2014, Alton Paul Burns, Climate change, Coal, Economy, EPA, fracking, Georgia, Government, John S. Quarterman, LAKE, Lowndes Area Knowledge Exchange, natural gas, Oil, pipeline, Regular Session, Sabal Trail Transmission, Safety, Spectra Energy, TCC, Thomas County, Thomas County Commission, Thomasville, Transparency on December 11, 2014 by John S. Quarterman. The Sabal Trail pipeline and probation payments were major issues at the Thomas County Commission 9AM Tuesday 9 December 2014. Sheriff R. Carlton Powell noted that private probation company Sentinel, which he said serves Lowndes County, was involved in several lawsuits. Here’s the agenda, and below are links to the videos, followed by a video playlist. This entry was posted in Economy, Education, Government, Incarceration, Law, Pipeline, Transparency and tagged 225 N. Broad Street, 9 December 2014, Alton Burns, Economy, Education, Georgia, Government, Incarceration, John S. Quarterman, LAKE, Law, Lowndes Area Knowledge Exchange, Lowndes County, pipeline, Regular Session, Sabal Trail Transmission, Sentinel, Spectra Energy, TCC, Thomas County, Thomas County Commission, Thomasville, Transparency on December 11, 2014 by John S. Quarterman. This entry was posted in Economy, Education, Georgia, Government, Natural gas, Pipeline, Safety, Transportation, Valdosta City Council, Water and tagged 9 December 2014, Economy, Education, FERC, Georgia, Government, John S. Quarterman, LAKE, Lowndes Area Knowledge Exchange, Lowndes County, natural gas, pipeline, Safety, Transportation, Valdosta, Valdosta City Council, Water, Work Session on December 10, 2014 by John S. Quarterman.